While the majority of alterative music fans concerned themselves with the muddy corporate behemoth that was T In The Park last weekend, in the Derbyshire countryside, hidden away in a remote valley, a discerning few attended Indietracks. It’s just about the quirkiest, cutest little festival in Britain right now, and a million miles away from anything quite so grandiose. Forget acres of Scottish greenery covered in a sea of Tennent’s-sponsored paper cups, Indietracks is set in the idyllic surrounds of the Midland Railway Centre in leafy Amber Valley, a stone’s throw from the towns of Codnor, Ripley and Alfreton. Each year, a couple of thousand indie-pop fans put on their best charity shop chic and come to Swanwick Junction – the epicentre of the preserved railway – to enjoy fine ales, good food, a friendly vibe and excellent music. 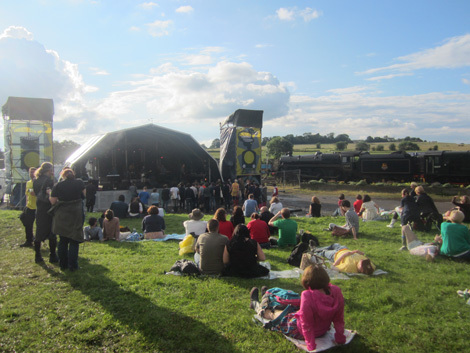 Bands play on a main stage next to the railway line as steam trains chug past. They perform in a tin tabernacle church, an engine shed and on the trains themselves! The beauty of Indietracks is that something is happening around every corner. From acoustic sessions in the merchandise tent, to cake decorating and “Indie Pop Lindy Hop” dance lessons from a drunken hirsute Scotsman, there’s always something that’ll stop you and say: ‘Hold on, what the hell is this?’. As for the music, artists range from unknown oddities, to bands from across the globe to underground cult bands and re-forming legends. On the opening Friday night of the three-day event, three bands officially open the festival in the engine shed, with Darren Hayman – once the leading figure in prolific 90s indie underachievers Hefner – as the headline act. His songs sum up the essence of Indietracks: nothing is straightforward or prosaic. On the Saturday, despite a diabolical-looking weather forecast, the sun shined. Basking in this unscheduled heat were Evans The Death, whose intelligent punk attracted a generous crowd, while mixing styles in the engine shed were Colour Me Wednesday, who combined Lily Allen in LDN mode with tinges of Kate Nash and the Cranberries. As the expected rain poured down, people headed back to the engine shed to see Leeds sextet the Rosie Taylor Project. Unfortunately, despite the best efforts of a rousing trumpet, their mood reflected the weather – miserable. More bouncy were Sheffield’s Standard Fare, whose name is apt for such a setting, and whose music is uplifting and unifying. London duo Summer Camp’s highlight is an acoustic rendition of Fleetwood Mac’s Everywhere in the centre of the crowd, while headliners Veronica Falls offer instantly addictive neat little pop songs. 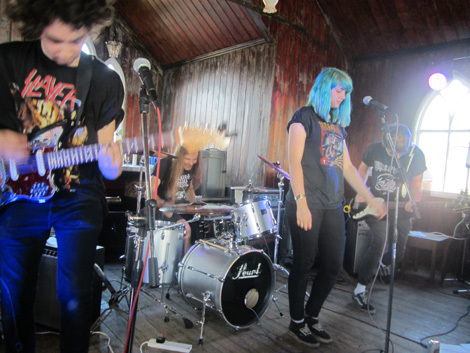 However, the highlight of the day undoubtedly came earlier in the church, where Joanna Gruesome – a teenage thrash-core ramshackle sensation from Cardiff – played with the DIY ethic of early Dinosaur Jnr. They only have 6 songs of their own but their special set promises broader horizons. Cardiff nu-grunge noiseniks Joanna Gruesome play the church stage, somewhat incongruously. Talking of highlights, Sunday’s was Belle & Sebastian singer and guitarist Stevie Jackson, whose folk-pop evokes images of dusty American country songs, mixed with a rapier-sharp Glasgow wit. Not even a downpour can mar the mood. And after funk-rock oldies The June Brides’ brilliant onstage reformation, Stevie Jackson appeared again with bonafide returning legendary heroes – and favourites of the late Kurt Cobain – The Vaselines, who stole the show with a festival-ending performance of sheer undiluted punk-rock laced with dirty tales and odd in-between song banter. And with that, Indietracks was over for another year. It had been another major success story, a brilliant friendly little jamboree which should never, ever change its winning formula.